It’s going to be a long, hot Warholian summer. 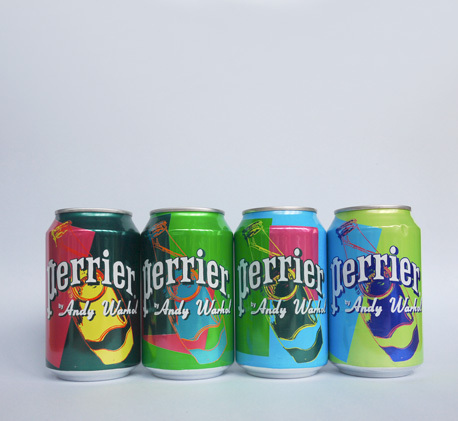 Whether zipping down the street on a Warhol skateboard deck, pushing your Andy Warhol + Bugaboo stroller, or simply chatting on your iPhone wrapped in a Warhol snap case, you can pop open a Perrier and quench your thirst the Warhol way. The Nestlé-owned brand is celebrating 150 years of fizzy water with a series of limited-edition bottles (and in Europe, cans as well) inspired by the artist’s 1983 screen prints of Perrier bottles. Perrier tapped Paris-based graphic design studio Hartland Villa to design the new packaging, which also features a selection of Warhol quotes, including “Art is what you can get away with.” You can get away with some art by entering Perrier’s “Take Home a Warhol” sweepstakes, which runs through September 30: one lucky winner will take home “Space Fruit: Lemons,” a 1974 Warhol original.